How Could Manchester United Bolster Their Attack Next Season? 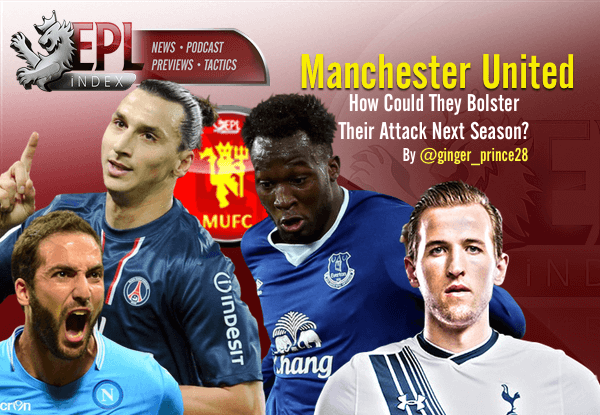 EPL Index > EPL Index Featured Article > How Could Manchester United Bolster Their Attack Next Season? This summer could potentially see some huge changes in personnel at Manchester United regardless of what happens between now and the end of the season. There’s strong rumours suggesting a possible managerial replacement in June with Jose Mourinho being the name that heads the wishlist and it would be interesting to see whether Ed Woodward is really willing to implement the change – after two years of uninspiring football (for the most part) under Louis Van Gaal and an alarming lack of substantial progress shown in terms of standing in the league despite the vast amounts of money spent on squad building. The overarching theme in the unanimous disapproval of the style of football that has been played at Old Trafford is undoubtedly the lack of goals. United have scored so few goals (42 in the league in 34 games) this season despite playing a sizeable amount of games across four competitions. The fact that none of the Manchester United forwards have managed to reach double figures in the league would have been unthinkable, say three years ago, but it unfortunately is the reality now. New signing Anthony Martial is the top scorer for United with 8 goals in the league followed by Wayne Rooney and Marcus Rashford with 7 and 4 each. That still happens to be comfortably fewer than the likes of Sergio Aguero’s goal tally at City, Jamie Vardy’s haul at Leicester City and Harry Kane’s numbers at Spurs. Isn’t this Van Gaal’s greatest shortcoming at United? Although these reduced figures could be partially attributed to Van Gaal’s style (look at the number of shots/game taken by the players below) that has not allowed the forwards at United to play with the freedom they would have liked to play with, some of the blame has to be apportioned to the players themselves for not being good enough on a consistent level. But then, United don’t have the necessary experience in the side in the attacking department, bar Rooney, who is not getting any younger and on Saturday’s evidence against Everton, he should be reconsidering his future at United if he wanted to continue playing up front. 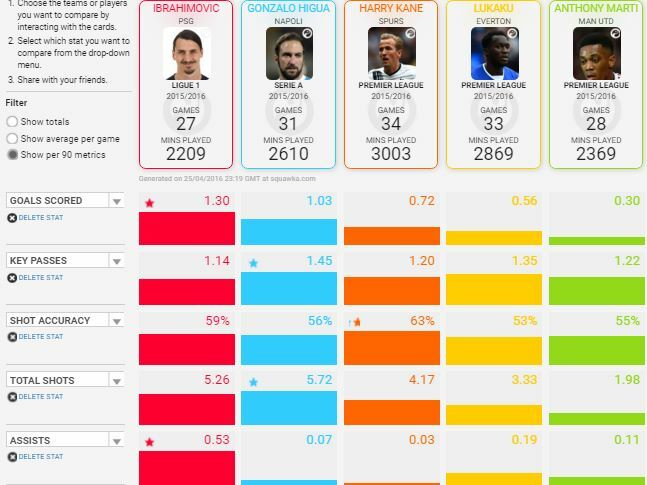 This is why Van Gaal or whoever the new manager is in the summer, should be looking to prioritise bolstering the attack as effectively as possible. Several newspaper reports across Europe suggest United’s quiet pursuit to land 34-year old Sweden international Zlatan Ibrahimovic, which could be as sensational a move for the PR as it could be risky for the club. Not many 34-year old(s) can make the move to England from a lesser league with all due to respect and hit the ground running, which is exactly what Manchester United want to avoid next season if they are to challenge for trophies on all fronts. What Manchester United need now is experience at the top level and the ability to do it for a few years down the line. Though, a potential lack of Champions League football at the club could prove a hindrance, their financial muscle should enable them to go for most players in Europe and that should be what they must focus on in the summer. Gonzalo Higuain could be an ideal signing, with the Argentine having played for the likes of Real Madrid and Napoli – so knows what it takes to play in a side with the expectations to compete and win week in week out. Moreover, the 28-year old is enjoying the best season in his career, scoring the lion’s share of goals for Napoli helping them in their bid to challenge Juventus for the Serie A title. While the league title looks a distant possibility, Higuain can still be hugely proud of the season he has had scoring 32 goals in 38 games this season that includes 30 in the league from 31 games at the rate of almost a goal a game. Having turned down a contract extension in August 2015 and agreeing to continue with the current contract that runs until June 2018, this summer should be the time Napoli would want to cash in on the Argentine and Manchester United and Ed Woodward need to look no further than him to boost their chances of improving their squad with a ready-made elite and in-form striker for the next few years. Categories: EPL Index Featured Article, EPL Team Analysis, Manchester United, and Manchester Utd (NN).' 'Tags: "Manchester United", english Premier league, English Premier League Opta Stats, English Premier League Stats, EPL, epl opta stats, EPL Stats, Gonzalo Higuain, Kane, Lukaku, Martial, Premier League Stats, Rashford, Rooney, Van Gaal, and Vardy. Is Javier Hernandez What Southampton Need This Summer?